665,000 square feet—Area of the building. The museum features 105,000 square feet of exhibition space, which is two times the area of the White House. 72,000 cubic yards—Volume of concrete. This is enough concrete to fill the Reflecting Pool two times. 85 feet—Height of Corona structure. 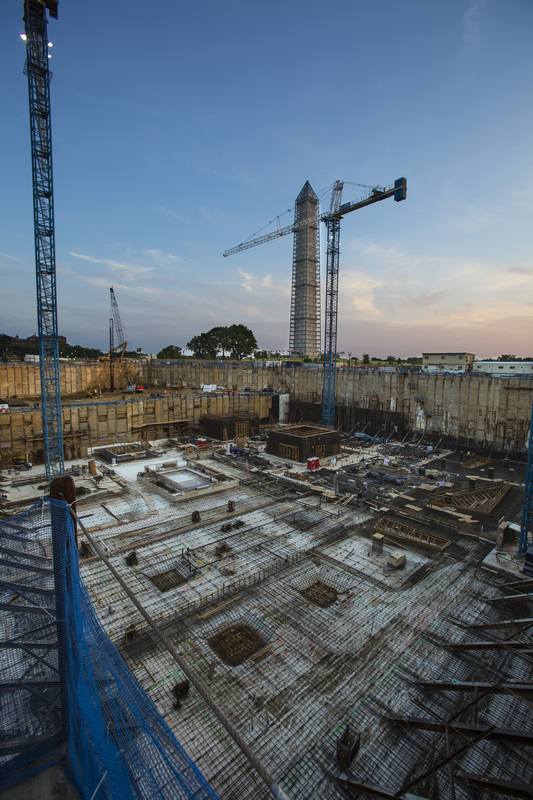 This is more than two times the depth of the Washington Monument’s foundation. 100 feet (five stories)—Portion of museum above grade. This is the height of the Lincoln Memorial. 70 feet (five stories)—Portion of museum below grade. This is the same height of the White House’s south façade. 2.5 tons—Max capacity of the service elevator. This elevator is capable of moving 2.5 Jefferson Memorial statues. 24 miles—Linear feet of HVAC piping. This is equivalent to the distance from the museum to Herndon, Va.
400 tons—Weight of ductwork to be installed. This is equivalent to 173 Jeep Grand Cherokees.